In one sense he did it all, playing for four big league teams and in a World Series. But it was the summer after he spiraled all the way from the majors to a middling minor league that gave Joe Wilhoit an enduring place in baseball. There he set a record threatened seriously only by Joe DiMaggio, a record that at the turn of the 21st century was 81 years old. Baseball America called it "the most significant on-field event" in the minor leagues in the 1911-1920 decade. Joe's year was 1919. The guns of World War I had been silent barely six months when he arrived in Seattle of the Pacific Coast League from the New York Giants. The reason for his downfall was painfully clear: He was having trouble hitting. In fact, a year earlier when he was waiting to become the wartime fill-in for Benny Kauff with New York, manager John McGraw was lamenting Joe's lack of batting output. By 1919 the slump was becoming apparent. In Seattle his average was only .165 after 17 games. Then it got worse. He learned he and pitcher Art Bowman had been traded to Wichita of the class A Western League for a one-time Washington Senator named Claude Thomas. Going from the Giants and a World Series to post-World War I Wichita would have caused at least some veteran players to review whatever passed for retirement plans in that era. The Kansas City still was close to its roots as a stop on the Chisholm Trail. And the ballpark was on an island in the Arkansas River where in the summer sand was more likely to blow than water to flow. But Wilhoit said he welcomed the trade. A sports columnist wrote the native Kansan found Wichita and the plains more to his liking than the Pacific Northwest. But even the return to his native state and a career free fall did not quickly cure Wilhoit's hitting virus. After 25 games in Wichita he was batting only .198. About the only thing between him and unemployment was a sore shortage of outfielders. Then Joe did start to hit and for almost 10 weeks did not stop. He didn't simply break the old record of hitting safely in 45 consecutive games set by Jack Ness at Oakland in 1915. He nuked it. For 69 consecutive games Joe hit safely and completed the season with a .422 average, best not only in the Western League that summer but in all of organized baseball. He also led the league in runs and hits. Only twice in later years did anyone threaten the Wilhoit successive-game hitting streak. Joe DiMaggio as an 18-year-old rookie hit safely in 61 successive games in 1933 at San Francisco of the Pacific Coast League. Then it was DiMaggio again who set the major league record of 56 consecutive games in 1941 with the Yankees, surpassing Willie Keeler's major league mark of 44 straight. In the beginning, Wichita team owner Frank Isbell had only a very ordinary reason to want Wilhoit: His team was struggling for outfielders. Western League rosters of the day had just 14 slots, eight for position players, five for pitchers and one for a utility player. After outfielder Paul Maloan was hospitalized following a beaning, Isbell had been forced to put pitcher Thomas in the outfield on days when he wasn't needed on the mound. Then he sent Thomas to Seattle where Wilhoit was available along with Bowman. That trade made the summer for Wichita and for Isbell. In turn, the team owner reawakened Wilhoit at the bat by working with him on his hitting. Isbell had the credentials. He had played in 1,119 major league games, mostly with the White Sox. He set a World Series record by hitting four doubles in the same game in 1906, a mark that still stood after the 2002 series, and one of the few older than Wilhoit's consecutive games hitting record. After his playing career ended, Isbell became a minor league owner, winding up in Kansas. He named his first Wichita team after himself, calling it the Izzies. Later his club became the Witches--the name when Wilhoit was demolishing the league--and finally the Jobbers. "Wilhoit is a finished ball player and one of the fastest outfielders in the game," the Wichita Eagle reported when it learned Isbell had traded for him. "While not a terrific hitter in the majors (he had a batting average of .257 in the 283 major league games in which he played) his speed will earn him many a base in the Western," the newspaper concluded. Isbell quickly utilized Wilhoit's speed, making him his leadoff hitter. Joe also was credited with being a good defensive player, the best in the league according to one newspaper account. In his first minor league season he had fielded perfectly during a brief stay in the California State League, then committed only 13 errors in 120 additional games in the Pacific Coast League (PCL). Sec Taylor was a sportswriter in Iowa who became such a regional legend that the Des Moines ballpark was named after him. In a column written after Joe DiMaggio's major league streak ended, Taylor recalled that Wilhoit felt George Stallings, his manager with Boston in the National League, had sent him into a long-lasting hitting funk by trying to change his batting style. Isbell advised Joe to change from a heavy, thick-handled bat to a lighter one. Wilhoit credited that change with restoring his ability to hit, Taylor said. Frank's coaching did seem to work. Wilhoit emerged from his slump on June 14 against Oklahoma City. For the following two months, he was the Ghengis Kahn of the Western League, batting .515 during the streak. According to statistics compiled by Mike Kiser, Clearwater, Kan., and cross-checked by Bill Deane, Joe had 153 hits in 297 times at bat. His hits included four home runs, nine triples and 24 doubles. The Witches enjoyed his coattails. They were last in the league when his bat ignited, and they rode it into title contention. "Three times and sent back without a hit, Wilhoit resorted to a bunt to reach first. He laid the ball to Bert Graham who had been called in from the field to play the hot corner after Larbeau had sprained his ankle. "Graham could have pegged his man at first, but with Omaha away to a big lead, he held the ball, giving Wilhoit his sixty-third game in a row in which he has hit safely. Graham's sportsmanship drew forth the admiration of the crowd." "The most outstanding thing about Wilhoit is his modesty and good nature. His great work has failed to swell his head. He is popular everywhere and papers all over the circuit have printed his picture and advertised him as the greatest player ever to perform in this league. "Not only in the Western has his work been noticed, but sports papers all over the country have given columns about his work. Wilhoit had a trial in the big show before but failed to hit consistently. There is no doubt that he has improved his weakness at the bat and should go up to the American (League) next year. He is still young in baseball and has several years to prove a big star among the great ones in the majors." In another edition, a Wichita writer noted, "Fans everyplace like Joe, as they prefer to call him. Joe is not a pugnacious player. He takes things easy and the fans, players and umps delight in praising his work. At Oklahoma City, Joplin and other towns where the team has appeared recently, the fans came out and rooted for Joe to add some more games to his streak." The streak finally ended at home on August 19. Elam Vangilder, who later spent 11 seasons in the major leagues, pitched for Tulsa against Wichita and retired Wilhoit three times - on a strikeout, a fly and a groundout. Joe appeared a fourth time, but was walked by Mutt Williams. Then came the rewards. Hats passed through the crowd at the park on the island produced more than $600 for Wilhoit, a comedown from the $2,445 given each Giant as losers of the 1917 World Series. But it was a major sum on a club where average monthly pay was $185. Another $100 came from a fan who late in the streak offered Joe $5 for each hit. His race for the record also attracted a trail of scouts. After the 56th game, the Cincinnati Enquirer wrote, "All clubs of both leagues, except Cincinnati, are bidding for him." So excited was the Enquirer that its story elevated Wichita from the Western League to the American. The Red Sox won the Wilhoit lottery, buying him before the season ended but leaving him in Wichita through the rest of the pennant race at Isbell's insistence. Isbell was a nervous man while the auction was underway because he wanted to keep his star. His wish prevailed, but it may have cost him. No purchase price ever was announced. Sec Taylor did say it was by no means a record. In the American League that fall, Wilhoit's bat remained hot. In six games with the Red Sox and 18 times at bat, he hit .333. But it apparently wasn't convincing. He spent the remaining four summers of his career in the minor leagues. At 6' 2", he was taller than most and weighed 175 pounds. (When he was with the Giants in 1917, the team's eight starting position players averaged 5'10" and only two were heavier than Wilhoit.) He was right-handed but batted left-handed. Wilhoit was a native Kansan, born at Hiawatha December 20, 1885,* in the far northeast corner of the state, The nearest town of size is St. Joseph, Missouri, where an early and well-known baseball fan, Jesse James, was shot and killed only three years before Joe was born. As a child, he moved with his parents, William T. and Mary McDonald Wilhoit, to Santa Barbara, California. There he was schooled at St. Vincent's College and then at DePaul University in Chicago, where he played baseball on a semipro team, Pop Anson's Colts. He apparently was 28 years old when he began his professional career in 1913 with Venice of the Pacific Coast League. He played there, at Stockton in the California League, Victoria of the Northwestern and Vernon in the PCL before joining the Boston National League team in 1916. Even though Wilhoit hit only .230 in his first major league season, McGraw wanted him for the Giants. But Pittsburgh claimed him on waivers, keeping him for nine games before again putting him on the market. That time the Giants won his services, and he finished the three-team season with a .285 batting average, largely on the strength of averaging .340 in his 34 games with the Giants. He hit safely in his first two appearances in a New York uniform, starting a game-winning tenth-inning rally in St. Louis on August 17 and following up the next day with a single in a three-run Giant seventh. He also appeared twice in the World Series that year. In Game 2 he hit in the eighth inning for pitcher Pol Perritt and lined the first pitch to shortstop Buck Weaver to start a double play. In Game 6 he appeared for pitcher Rube Benton and walked, but was forced out at second base. 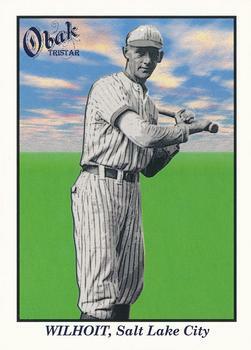 He spent the war season of 1918 with New York again, alternating with Jim Thorpe as a fill-in outfielder. He hit .274 for the season. A newspaper biographer noted that part of his value to the Giants as a wartime player was his marriage, which cut the odds that he would be drafted into the service. A year after his record-setting summer in Wichita, Joe began to prepare for life after baseball. He bought Gray's Trunk Shop in Santa Barbara, renaming it Wilhoit Luggage Shop. He joined the Elks Lodge and La Cumbre Golf and Country Club. And he continued his love of the outdoors, particularly hunting and fishing. He still had four years of baseball left, all in the highest minor leagues, where he hit .300 or more each season. From the Red Sox he went to Toledo in the American Association, then played three years for the Salt Lake City Bees of the Pacific Coast League, already spoken of at times as a third major league. Author Scott Mackey, in Barbary Baseball-The Pacific Coast League of the 1920s, tells how in his final season - 1923 -- Wilhoit figured into one of the PCL's legendary strategic episodes. On April 28, another Bee outfielder, Paul Strand, was starting one of history's best offensive years. He would hit .394, bat in 187 runs and produce 43 home runs. He also set the organized baseball record for hits in a season with 325. With two out and the bases loaded in the bottom of the ninth, Oakland manager Ivan Howard ordered Strand walked, forcing in one run and putting the tying run on third, so his pitcher could face Wilhoit, who would hit .360 that summer. The plan worked. Harry Krause induced Joe to hit a fly for the final out, making that moment one of the few in baseball's long history that a batter was walked so a pitcher could face a .360 hitter with the winning runs on base. By the time that season ended, Wilhoit was 38 years old, wearing down from playing in the PCL's 200-game seasons. He decided to make the luggage shop his full-time job and retired from baseball. Tragedy ended his life in 1930. He became ill in late summer and two months later died of lung cancer. His wife, Katherine Z., two brothers and three sisters survived him. The Santa Barbara News Press noted, "The friendships formed during his big league days were never forgotten and at the time of his last illness letters and telegrams from his old associates brought him much cheer." * Wilhoit's age appears to have been more closely guarded than the Coca-Cola formula In various publications, his date of birth ranges from 1885 to 1891 and his birthplace varies from Los Angeles to Illinois to Kansas. In 1920 the census enumerator found him at the home of his parents-in-law, Mr. and Mrs. James H. Hicks, in Newbern Town, Virginia, where he gave his place of birth as Kansas. But no one there could -- or would -- give the year of his birth and the census taker dutifully noted it as "unknown." In this biography 1885 is used in agreement with Macmillan's Baseball Encyclopedia and his age is calculated from that date. However, Wilhoit's California death certificate, which was signed by his sister, says he was born in 1888. The Wichita Eagle, April-September 1919; September 26, 1930; July 18, 1944. Omaha Daily News, July 17, 1919. Des Moines Register, August 3, 1933; July 16, 1941. Baseball America, May 27, 2001. The Sporting News, October 15, 1915; July 24, 1944. Cincinnati Enquirer, August 3, 1919. Santa Barbara News Press, September 20, 1930. "A Closeup of Joe Wilhoit," Unattributed, The Sporting News April 2, 1918. State of California Standard Death Certificate. The New York Times, August 12, October 1-17, 1917; March 17, 1918. U.S. Census, 1920, 1930, National Archives. Head Games by Roger Kahn. Wilhoit Streak Statistics, Mike Kiser and Bill Deane, The Sporting News Archives. Bush League--A History of Minor League Baseball by Robert Obojski.